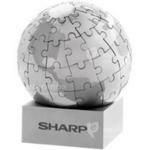 Advertise your companies details and logo on our exclusive Globe magnetic puzzle with logo. 72-piece Globe magnetic puzzle with logo. Size: 7.5cm diameter globe on 4.5cm square base. Logo area: 25mm x 25mm. So why not have your company details and logo printed on our high class stainless steel desk top jigsaw puzzle? Our Globe magnetic puzzle with logo is an excellent desk top item that can be used as a paper weight or just look impressive and beautiful. This memorable corporate gift will create great interest on anyones desk, circulating your name and strengthening your corporate identity. Other promotional and personalised items besides our Globe magnetic puzzle with logo Click here. To find out more about our Globe magnetic puzzle with logo click here and fill in the contact form and we'll get straight back to you.